Lead in Drinking Water Fountains? Ever wonder about the quality of water coming out of a drinking water fountain? Perhaps you should since a good number of drinking water fountains in public places still may contain older plumbing that contains pipes joined together with lead-based solders. Even as universities across the country are banning bottled water, alarms are going off about the safety of the water coming out of drinking fountains at some Canadian campuses. The student newspaper at St. Thomas University is reporting that eight drinking fountains at the small university are being shut down because of high levels of lead detected in the fountains. According to the report, STU only looked into their fountains after recent tests at the University of New Brunswick showed unacceptable levels of lead in 18 per cent of fountains and sinks — along with others that were very close to the limits set out by Health Canada. We included that last paragraph so that no one would say, “Oh, well see? It’s just a Canadian problem. We’re safe here in the United States…” And yes, we get emails from people all the time saying silly stuff like that. Why has lead in drinking fountains gone unnoticed for so long? Honestly, we do no know. We’d guess that many people just assumed removal of older, lead-baring piping inside and hooked up to drinking water fountains would take place when all of the other piping in buildings got replaced, and as you can see they must have guessed incorrectly. How do we test for lead in drinking fountains? While qualified laboratories use sophisticated testing equipment that may cost thousands of dollars, the average person (like you and me) can acquire simple, easy-to-use and highly affordable lead in water test kits. 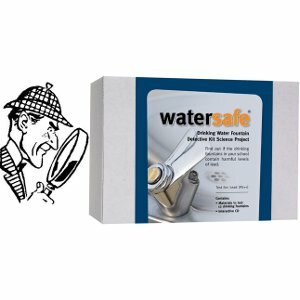 One kit in particular, the Watersafe Drinking Fountain Detective Kit (WS-207T), includes supplies for testing (12) twelve water samples, comes with a data tracking sheet to record results, provides results in just ten minutes, requires no special training or testing skills, and contains an interactive CD designed to help create a presentation template for the testing data. What about other metals? Can we test for those, as well? Absolutely! While more complicated test kits do exist, the average person (like you and me) can use simple, dip-n-read test strips for metals in water such as the SenSafe Water Metals Test Kit to perform on-the-spot testing. Products like this detect heavy metals such as lead, copper, iron, chromium, nickel, cadmium, etc. and alert users to the presence of metals — down to levels as low as 10 parts per billion! 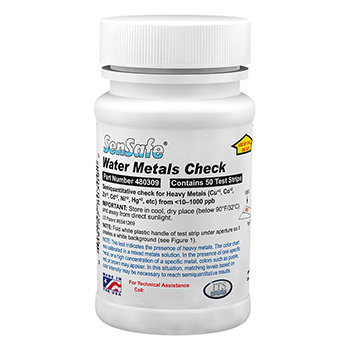 Note: Although Sensafe Water Metals Check does have the ability to detect really low amounts of metals in water, it does not have the ability to tell user which metal or metals it has detected. « How Can I Check to See if My Water Filter is Working?